So here’s the rundown of our first update – adding an upholstered headboard. 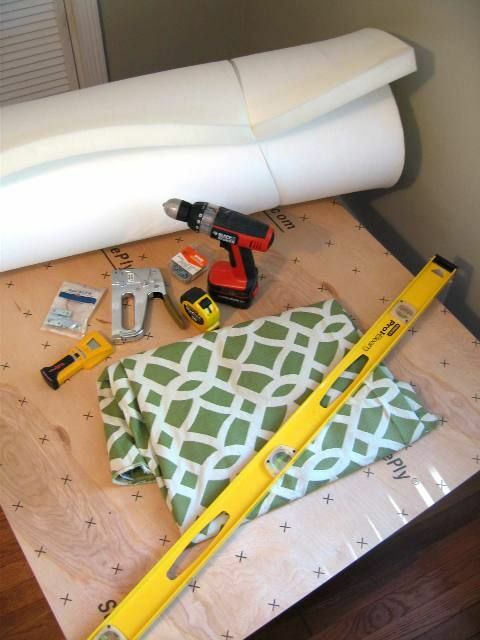 Step One: Determine your headboard size. We had our plywood and foam both cut to size for free when we purchased them. This cut out tons of time and mess at home later. Our bed is full size which gave us our 54″ width, however we determined the 40″ height pretty much by eye-balling it. We knew we wanted the headboard to fall slightly below our mattress line so that even when the bed isn’t made, you wouldn’t see the wall below the headboard. We also propped our pillows up against the wall as if we had a headboard to determine how much space we wanted to poke out from above the pillows. This gave us our 40″ height. 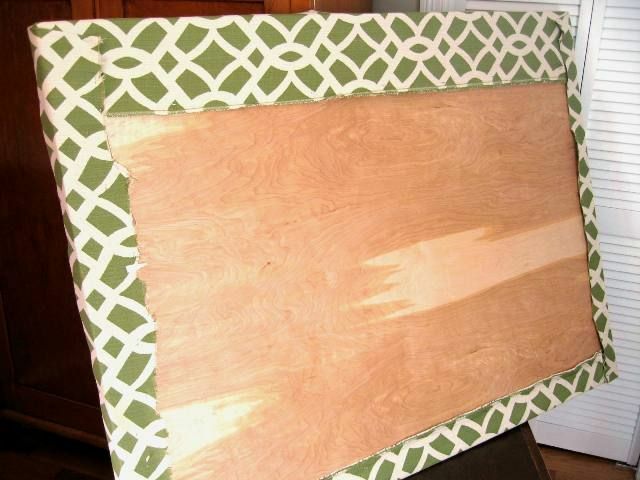 Step Two: Determine your headboard’s shape. There are tons of shapes out there to choose from, basic rectangle, rounded edges, more feminine curved shapes, Georgian style arches, etc. This is the fun part of this project – you really can make any shape you want and can get super creative. We planned to do a simple rounded headboard, but when we propped our plywood up behind the bed to determine where the curve should start, we actually really liked the basic rectangular shape. We also found the simple lines would work well with our busy fabric. Step Three: Upholster the headboard. Once you have your size and shape decided and cut out to match one another it’s time to assemble everything. For a full size headboard you’ll need 2 yards of fabric, for larger beds you’ll need more of course depending on the height and shape you choose. Most would probably tell you to choose a nice basic fabric that will go with everything so you can switch out your bedding easily – but we think this is a great place to get creative and just choose a fabric that you love. 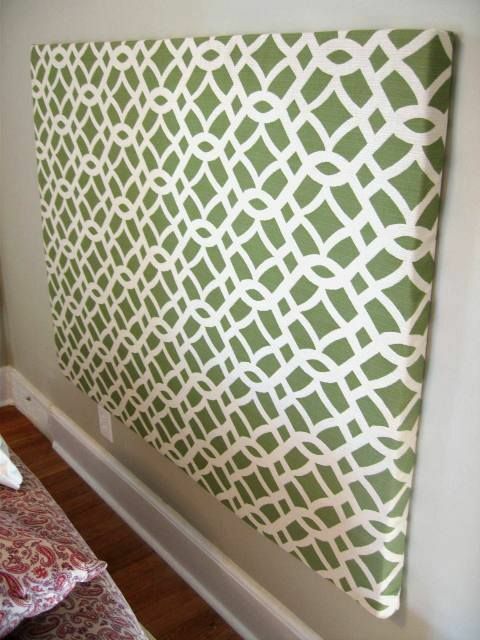 We would never purchase an actual bed in our crazy green trellis pattern, but this simple headboard is so easy peasy we’ll have no problem switching it out later if we change our minds. We cut our fabric to size and then ironed it out to get rid of the wrinkles and folds. Even if your fabric looks pretty good, we’d recommend ironing anyways just to guarantee it comes out perfect. If you choose a graphic fabric like we did, be sure to take a couple of extra minutes to make sure that the pattern is centered on your headboard and is lined up straight. If you’re anything like us, a crooked pattern will drive you nut-so. To make stapling our fabric easy, while still keeping an eye on our pattern’s positioning, we laid the plywood, foam and fabric on a smaller bench. Doing this let us work around the edges. Just stretch and staple your fabric onto the plywood making sure your corners are neatly folded, we used a “hospital” style corner for ours. Step Four: Mount your headboard to the wall. 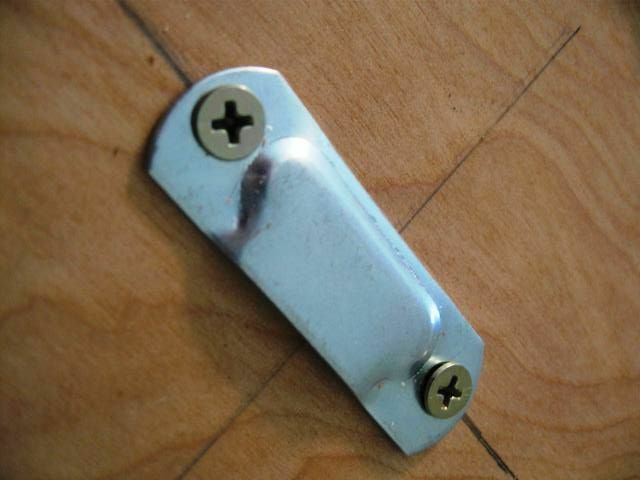 Using a simple pair of flush mounting brackets, you can mount your headboard to the wall with just a few screws. We were not able to find these mounting brackets in our Lowes, Home Depot or True Value, but for $4 or so we scored them with free shipping from Rockler, an online woodworking shop. One bracket mounts the wall and then another piece mounts to the headboard, then the just slide the headboard against the wall and the brackets into each other. The trickiest part here is lining your brackets up with each other. But with a tape measure, level and pencil you’ll be able to get it right on the first try. 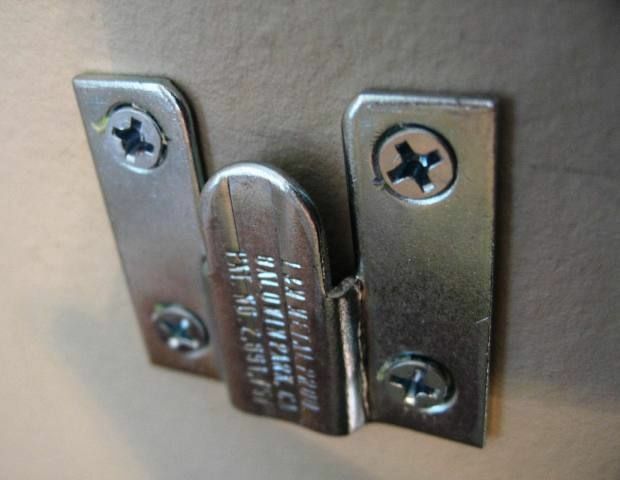 Make sure to install your brackets on the studs for added load capacity. Then just slide your bed frame back up against the wall and you have an instantly updated bed – all for about $80. Half of our expense was fabric so you can always do this for less if you find cheaper fabric or have plywood on hand.